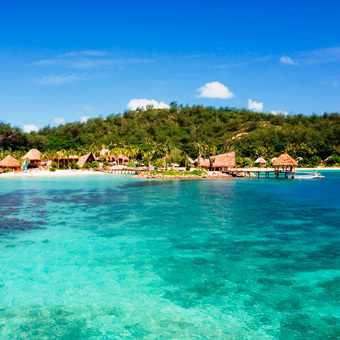 Fiji has always been popular with honeymooners and people seeking luxury and romance. Let us help you plan the perfect luxury Fiji escape – we pride ourselves on providing service that is unattainable at any other Fiji travel agency. 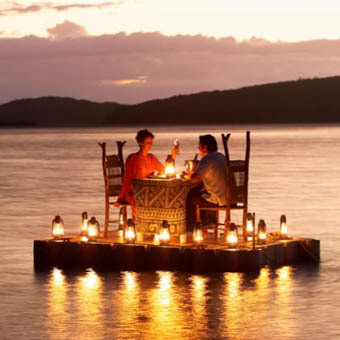 Fiji defines romance and luxury – warm weather, luxurious accommodation, sumptuous fresh food, beautiful surroundings and crystal clear water. With a multitude of resorts to choose from, your biggest dilemma will be deciding the best place to stay. Perhaps you want privacy and seclusion where you are left to indulge in each other’s company? Or maybe you’re the action / adventure type who can’t sit still? Rest assured, Fiji is an adventure lovers playground! If the party lifestyle is more up your alley there are resorts where you can’t help but make new friends – nightclubs, swim up pool bars, planned social events… there’s so much to do and such little time… Travelling with children? No problem! We can advise what resorts offer great Kids Clubs and 24 hour babysitting facilities. Perhaps you want to experience a little bit of everything? Whatever your preference, our experienced team can advise you what resorts will best suit your requirements and budget. With over 40 years experience in Fiji, we can organise the honeymoon or luxury Fiji holiday wedding you have always dreamed about. Because we are independent we build your Fiji honeymoon or holiday around what you want, rather than what’s on offer. We will work in consultation with you to create the perfect Fiji escape. Below we have compiled a list of what we consider to be the best luxury resorts and hotels in Fiji perfect for your luxury escape or honeymoon. We have based this on our 40+ years experience creating luxury Fiji holidays, along with feedback received from our clients. Turtle Island is an all-inclusive, private island with home to only 14 couples at a time. 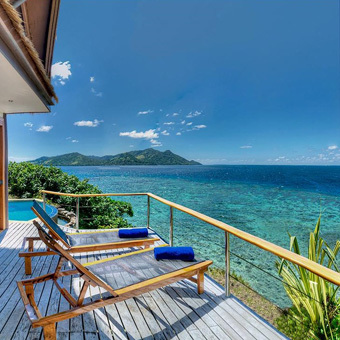 The breathtaking panoramas of the renowned Blue Lagoon and neighbouring Yasawa Islands can be seen from your spacious Fijian villa. 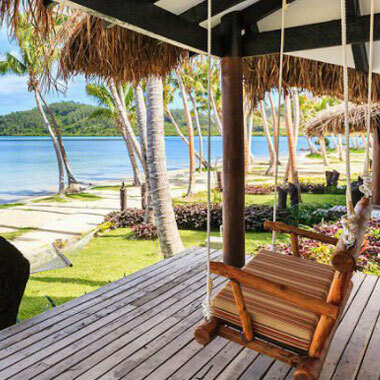 During your stay at this exotic island retreat, your home will be one of only 14 private villas, or “bures”—traditional, authentic, eco-friendly, two-room cottages built by Fijian craftsmen. Spacious, romantic, and wonderfully relaxing, light spills in from windows that overlook the tranquil waters of the Blue Lagoon while gentle winds carry the intoxicating scent of tropical blossoms through the breezy interiors. 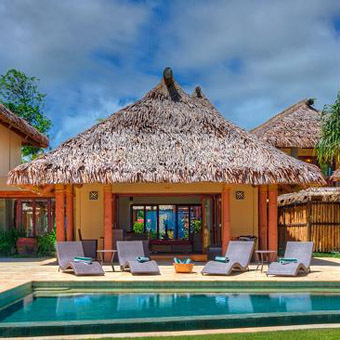 Vonu Point is Turtle’s premium bure—a traditional, two-room thatched cottage crafted by Fijian artisans. Elevated at the north end of the spectacular Blue Lagoon beachfront, it enjoys total privacy and breath-taking panoramic views of the lagoon and neighboring Yasawa Islands. For the ultimate in exclusive island accommodation you cannot go past Vomo Island Resort! Surrounded by trademark crystal clear waters and blessed with soft white sands, Vomo Island resort is truly a Fijian Paradise. Vomo Island resort offers a truly unique and personal Fijian experience that you will surely not forget. There is a choice of accommodation available including beachfront villas that are only a few steps away from the crisp white sandy beaches. The hillside and garden villas are situated near Mount Vomo and offering breathtaking views of the gardens, island or ocean. There is a four bedroom residence that is situated right on the beach and offers up to eight guests the ultimate in luxurious privacy with full kitchen for self or on site catering. The ‘Royal Villa’ is nestled into the base of Mount Vomo on the eastern end of the island and is a stylish oasis offering privacy and discretion from other guests. The island is conveniently located a short 15 minute flight by helicopter or sea plane from Nadi International Airport. 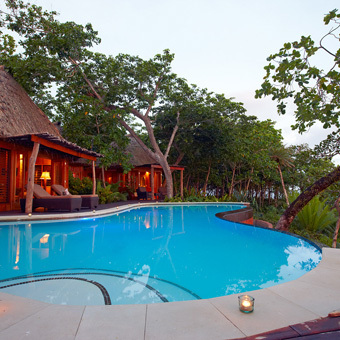 Likuliku Lagoon Resort is a haven of subtle luxury, designed with integrity to cultural values and traditional design. Likuliku Lagoon Resort is embraced by the renowned warmth of the Fijian people. 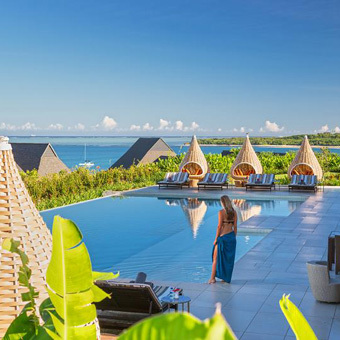 Likuliku Lagoon Resort offers faultless luxury for people looking for the perfect island escape. Likuliku over water bures feature traditional architecture and natural materials unique to the region, these unique and stylish bures provide pure Fijian bliss. 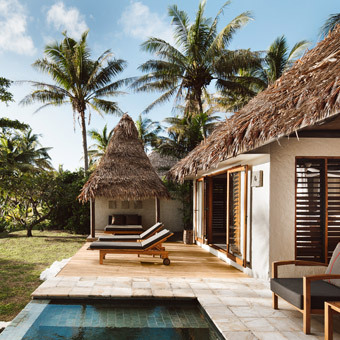 The deluxe beachfront bures are your own private sanctuary on the beachfront with a personal plunge pool and a split level design that optimise views of the lagoon. You won’t ever want to leave your room! The beachfront bures are mere steps from the beach and in a secluded haven of relaxation and privacy, these bures offer beautiful interior and inescapable views or your surroundings. Likuliku Lagoon Resort is located just 25km from Nadi International Airport. Royal Davui is an adults only resort and offers barefoot Fijian luxury at its finest. Just a few guests can be accommodated at Royal Davui, so be prepared for an exclusive and exceptional experience from the moment of your arrival. Here the world-renowned warmth and hospitality of the Fijian people awaits you. Royal Davui Island Resort is an adults only resort, offering an ideal tropical island escape, vacation, honeymoon or wedding. The Island Pool Villas have stunning views of the lagoon and reef system below and feature their own own private plunge pool. The five deluxe pool villas feature views of picturesque Beqa Island and the expansive reef system that surrounds Royal Davui. All deluxe vale are split level with an open-plan design, feature two private decks and private plunge pools. The six premium pool villas feature an elegant tropical design and are purposely casual, just the way Fiji should be. In addition to your private plunge pool, each of premium pool villa has two large verandas as an extension of the living area with vistas of the Beqa Lagoon and stunning sunsets. The royal davui pool suite feature hand-carved solid mahogany double doors that guard the entrance to your personal sanctuary – the only one of its kind on the island. Opening this gateway reveals a hidden paradise, where an indoor garden welcomes you and leads your gaze outward toward the azure Beqa Lagoon beyond. The Davui Suite is truly special for those truly special locations. 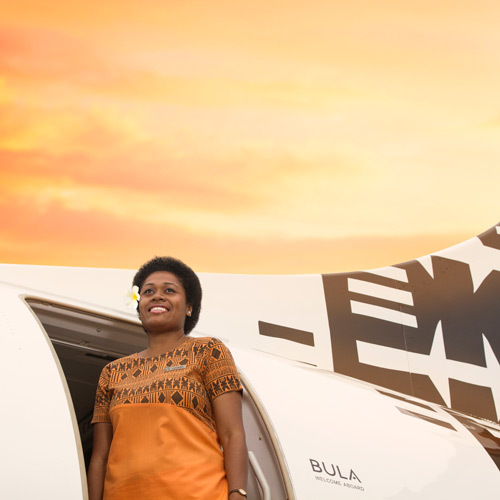 Just a 50 minute plane and launch transfer from Nadi airport will get you to the lush tropical paradise that is Royal Davui Island. Created exclusively for couples, escape to the peace and tranquility of your own private paradise. Imagine a thatched villa of your own secluded palm-fringed cove against a back drop of spectacular sunsets… Tadrai Island Resort is the ultimate luxury, adults only destination, with five ultra-deluxe, 100 square metre beach front villas designed to provide guests with total privacy and tranquility. The 100 square metre villas feature original artwork and decor reflecting Fiji’s historic past. Private plunge pools open directly on to elevated decks with panoramic views. Wander Tadrai’s four secluded beaches, don fins, mask and snorkel, or choose the leisurely peer-down reef board option to investigate the marine life of the outer reef – the possibilities are endless. Jean-Michel Cousteau Resort is a favourite for romance, honeymoons and families who want to combine heavenly surroundings and exceptional dining with an unsurpassed range of eco-friendly activities. 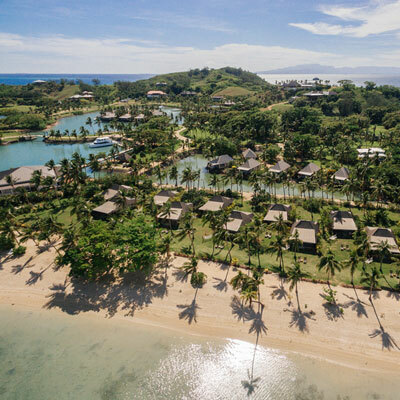 Set amongst lush tropical landscapes and the peaceful waters of Savusavu bay Jean-Michel Cousteau Resort promise a holiday that is sure to delight and indulge all guests. Garden view bures overlook tropical landscapes, colourful flowers and exotic plants. Ocean view bures offer privacy and unsurpassable ocean views. Oceanfront suite bures are designed for honeymooning couples or families of 5 and offer privacy and stunning views. Oceanfront two bedroom bures are ideal for families of 4 or 5 who want ocean views, comfort and more privacy. The point view bures are private, split level and set apart from the rest or the resort making them perfect for people seeking privacy and seclusion. ‘The Villa’ features lush tropical gardens, a private plunge pool and a spacious relaxed living area. Jean-Michel Cousteau is just a 1 hour flight from Nadi International Airport. The adults only, Tokoriki Island Resort is located in the stunning Mamanuca Island Group. It is a luxuriously exclusive island escape perfect for a romantic getaway. Exuding Fijian hospitality, and with picturesque white sandy beaches and crystal clear water, Tokoriki Island Resort offers affordable indulgence with a contemporary twist.The luxury bures and villas at Tokoriki Island Resort are a fusion of Fijian architecture and contemporary Island style, with all the modern luxuries and amenities expected on a luxury island resort with only 26 Beachfront Bures and 8 Sunset Pool Villas. Your bure or villa is spacious, freestanding (ensuring absolute privacy), air conditioned, ceiling fans and indoor/outdoor private showers. All beachfront bures and villas are equipped with coffee and tea making facilities, mini fridges, hairdryers, bathrobes, iron & ironing boards, beach mats, umbrellas, in-room safes and outdoor day beds, plus a hammock! Your beachfront bure or villa is only a few steps to the beach and offers uninterrupted views of the stunning evening sunsets over the Pacific Ocean. 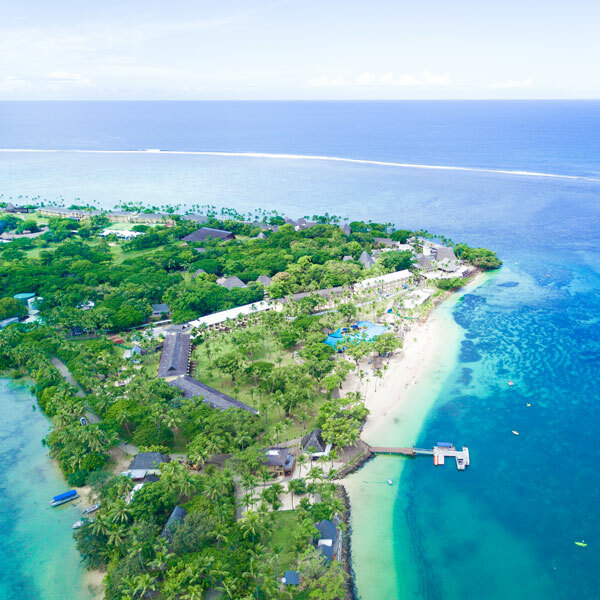 Thirty five kilometres off the west coast of Nadi – Fiji’s international gateway – Tokoriki Island Resort is the northern most island in the Mamanuca group. Just a 12 minute seaplane flight or 90 minute launch transfer from the mainland. Poised high on a plateau overlooking one of Fiji’s best beaches, Club InterContinental is Fiji’s first and only ‘Club’ experience offering discerning travelers the exclusivity of a resort within a resort. You’ll enjoy exclusive access to our Club InterContinental Lounge, with a private infinity pool, dining privileges and sunset cultural entertainment. Reconnect in the unparalleled comfort of our 55 hilltop suites where spacious interiors blend seamlessly with outdoor living areas featuring a Cleopatra Bath, relaxing day bed and private plunge pool in select suites. Whether you need a little extra attention or are seeking to retreat within your own space, surrender yourself to our Itokani butlers and the exclusive luxury of Club InterContinental. As a guest of Club InterContinental you will enjoy private check-in and check-out, 24 hour Itokani butler service, exclusive cccess to the Club InterContinental lounge and infinity pool, breakfast in a choice of 3 venues, all day non alcoholic drinks in the Club InterContinental Lounge, afternoon tea in the Club Intercontinental Lounge, sunset canapes and cocktails for 2 hours each evening in the Club InterContinental Lounge (adults only), complimentary wireless internet access throughout the resort, daily turndown service and complimentary Planet Trekkers sessions for our younger guests. Spend a single moment upon Namale’s blissfully pristine beaches, in its luxuriously furnished accommodations or taking in its breathtaking tropical setting, and you’ll be convinced the words “Paradise found” were first spoken with this world-class, internationally award-winning resort and spa in mind. Spend a single moment upon Namale’s blissfully pristine beaches, in its luxuriously furnished accommodations or taking in its breathtaking tropical setting, and you’ll be convinced the words “Paradise found” were first spoken with this world-class, internationally award-winning resort and spa in mind. Bures are tucked away amongst lava pinnacles, lush jungle foliage or rain trees. Each bure is completely luxurious and utterly charming. The villas are discretely situated at the edge of volcanic uplifts with views of the ocean and surrounding terrain, its architecture and floor plan only add to the ambience of the villa, allowing for a serene, romantic setting. The Bula House is perched on the edge of a lava pinnacle and features a well-appointed kitchen, A/C, deluxe lounge, billiard table, Wi-Fi, intimate movie theatre and Bose® sound system together with two guest houses and private beach and pool. Tadra House, aka the ‘dream house’, is nestled on sultry volcanic rock formations and showcases the finest attention to detail. Nanuku Resort & Spa is set on lush tropical gardens on the beachfront looking over pristine waters of Beqa Lagoon, the resorts personal butlers, private nannies and tailored experiences are part and parcel of your Nanuku stay. The resort offers four cliff top suites and expansive beachfront residence steps from the soft white sand beach. 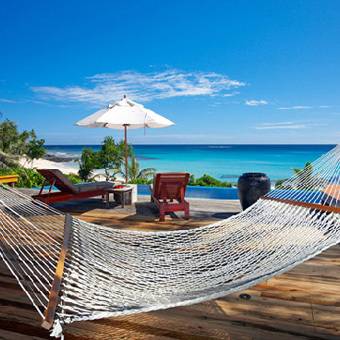 Nanuku has 4 luxurious suites, 5 beachfront residences comprising of 3 villas. The resort is suited to a discerning luxury traveler. Nanuku had an all-inclusive tariff that includes breakfast, lunch and dinner served daily at the Club House in our Kanavata Restaurant, return private car transfers from Nadi or Suva airports, butler service (8am – 9pm), nanny service (8am- 9pm), villa golf buggy, WIFI throughout the resort, use of non-motorised water sports and daily GM hosted drinks and canapés. Nanuku is located in the Pacific Harbour precinct and is just under 2 hours drive from Nadi Airport and 55 minutes from Suva Airport. Nanuku is also services by its own sealed airstrips, catering for helicopters and chartered plane transfers. Exclusive, private and stunning sum up Yasawa Island Resort. A Fijian paradise that will leave you relaxed and indulged. Yasawa Island Resort and Spa is an exclusive retreat on one of the most remote and unspoiled islands of Fiji. Just 18 luxury bungalows are hidden among the palms, each just a few steps from a pristine white beach. 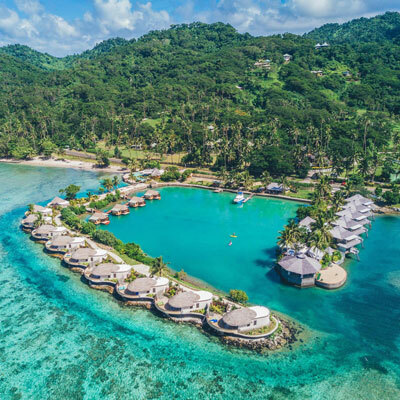 Swim in crystal clear waters, dive on vividly coloured corals, connect with an ancient culture or indulge in Fiji’s first beachfront spa. Whatever you choose to do at Yasawa, you’ll do it in complete seclusion. Bure suites set a luxurious benchmark with their modern styling, open plan and ocean views. Scattered in pairs among the palms, they share just one adjoining wall and are positioned for privacy – the only thing you’ll see from inside is the beach. The deluxe bures are vast and free-standing, offering ocean panoramas from inside and out. A split-level design creates separate living and sleeping areas inside, while broad decks and shaded day-beds extend the living space outside. The two bedroom bures are perched on a rise overlooking the rest of the resort. These huge family bures offer two separate bedrooms either side of a central living area. Its elevated outdoor deck provides magnificent views over the island and out to sea, and its name. The honeymoon suite, ‘Lomalagi’ (the Fijian word for heaven) is hidden from the rest of the resort at the end of a deserted white beach. This private retreat with its own horizon pool overlooking the ocean. This is Yasawa at its best – absolute luxury and complete seclusion. Yasawa Island Resort is located in the Yasawa Group of Islands. You can reach this stunning resort with just a 35 minute flight from Nadi Airport. Need assistance planning your Fiji honeymoon? No-one knows the extraordinary Fiji Islands like we do! We are specialist Fiji travel agents and can organise every aspect of your holiday. Whether you’re planning a luxury escape, romantic honeymoon, family holiday, destination wedding, group holiday with friends and family, Fiji cruise or corporate retreat, we can help. Be sure to check out all our Fiji holiday deals and travel specials.